It has been quite some time that I have been using the Delhi-Gurgaon metro on a daily basis. Regular travelers would understand the fact that it’s a little irritating to travel in that line, in a crowded metro, particularly because the stretch between Qutub Minar and Guru Dronacharya seems never ending. As a regular traveler, which most of us are, we come across loads of irritating and interesting things which further agonize or help us time pass during our metro travel. I managed to list down five of them based on my observation. Well you know, metro is being used by almost all sections of the society these days and the same goes for Mobile phones. Gone are the days when only pre-installed ringtones ruled the world. It’s the generation of innovation. From Bhakti Sangeet to Masala Songs, you get to listen to all sorts of innovative ringtone once you board the metro. Adding to the charm are local Chinese phones with 100 woofers. Well, who said metro rides can be boring. Well, Gurgaon employees (as in people working in Gurgaon) have this habit of bring their office work to metro. After a day of hectic work, it’s mandatory to discuss office gossip during your metro ride. Who cares about that lonely guy who is travelling alone and has forgotten his ear phones back home? Oh come on! India guarantees right to freedom of expression. Let him get irritated. 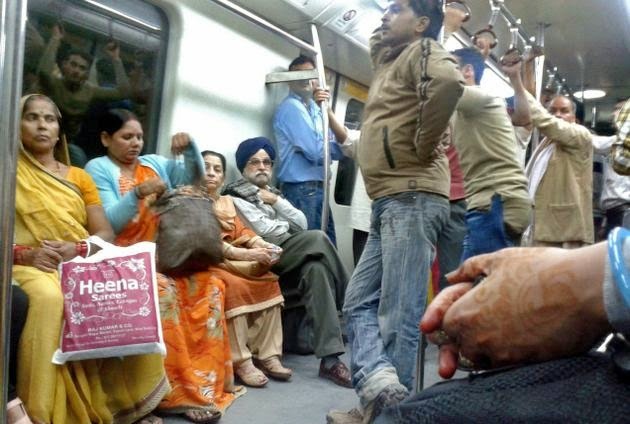 So if we ignore the two couple seats near the door, Delhi metro can accommodate seven people comfortably in that long bench between the doors. Seven by the way can be stretchable to 12 as this is India. With 2 of the seats reserved for women, men fight it out for just five. Once you ride a metro, it’s a game of luck and skill for you to get a seat. If you can guess the correct person who might get down before your destination (which can be achieved creepily by stalking their conversation/noticing their anxiety of checking the electronic display board/ or by simply asking them). You can book a seat by standing right in front of them (Till the time some senior citizen asks you to vacate the seats). Which is the best place to discuss politics? Newsroom? Office? Home? Dinner? No of course Metro. I am so damn interested in knowing why you support Rakhi Swant’s candidature. I agree with you in BJP being the best solution for India. I would even say that every Metro compartment should be given an Arnab Goswami each to moderate the debate. I sure many more metro talks can change the position India is in. So which is the best game that is trending these days in your Google Play Store/Windows store/Apple store? Don’t open your phone now. Just take a metro ride, almost everyone (apart from the types mentioned above) play games on phone. Thanks to Indian companies Micromax, XOLO etc, almost everyone has an Android phone these days. So check out the most played games just by observing these travelers. For me, Subway Surfer and Candy Crush Saga are currently leading the tally. The same goes for headphones. Almost for everyone travelling alone (including yours truly) it’s almost complimentary to plug in your ear pieces. So next time you forget your headphones home and feel bored during the journey. Notice the ear phones, I am sure you can work on the most popular brand from it. To me during all these times i am sure a productive outcome is what which works 3 days trip from new york is quite appreciable and works majority of the times it works to me..